Steel pull handle Hoppe model EX5041 round series. Wood, aluminium and pvc fixing set are included. More fixing set available here. Choose the size here beside. Pull handles with an incredible charm. 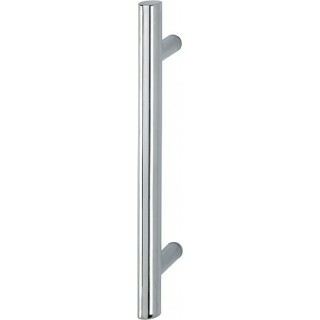 Only Hoppe develops beautiful durable and functional pull handle. Accessories Hoppe enjoy a worldwide reputation due to the careful and rigid production process received. .
Hoppe founded in Germany, the world leader in the sector has been in business for over 50 years. HOPPE offers you an extensive range of hardware made from aluminium, stainless steel, nylon and brass for doors and windows. Our broad range of products leaves almost nothing to be desired. Modern or classic, straight lines or curved, Hoppe's hardware can include subtle design features, some is designed to be eye-catching and some has been developed by well-known designers. As well as shape, the various surface structures of the hardware also lend a truly unique character. This is further enhanced by the range of colours available.All these features shape the look and feel of the selected hardware. They can be combined in a whole host of different ways so you can customise your windows and doors. HOPPE brass handles is made of high quality brass alloys. The surface is protected either by a transparent lacquer of elevated adhesive strength and resistance to solvents and chemicals. Instead the surface of our aluminium fittings is protected by either anodising or powder coating. Anodising consists of a controlled, electrically induced oxidation process with the aid of sulphuric acid, which causes the base material to bond with oxygen and to grow a protective surface layer, the so-called oxide film. Hoppe is a leading company that has developed significant patents for improving the security, also it handles enjoy an excellent market price. Our experience in the field of handles, allowed a strict selection of the best italian brands manufacturer of door and window handles. Therefore we present only handles quality, manufactured with the best alloys and careful production cycles. We are Hoppe retailers because is a leader who has developed significant improvements in safety especially for its patents developed through cutting-edge technologies. Also guarantees the function and surface are 100% reliable, as evidenced by the various tests done on all handles.